Compounds of carbon and hydrogen are called hydrocarbons. These are further divided into two classes: saturated and unsaturated hydrocarbon. Hydrocarbons in which all the carbon atoms are linked to one another by only single bonds are called saturated hydrocarbons. These ma be either acyclic or cyclic hydrocarbons. Saturated acyclic hydrocarbons are called alkanes.They are also called paraffins since they are relatively inert towards most of the chemical reagents. The IUPAC names of alkanes are obtained by adding suffix ane to he word root indicating the number of carbon atoms. Straight chain alkanes : These alkanes contains straight chains of carbon atoms in their molecules. Alkanes in which no carbon atom is linked to more than two other carbon atoms are called Staight chain alkanes. Alkanes in which at least one carbon atom is linked to three or four other carbon atoms are called branched chain alkanes. 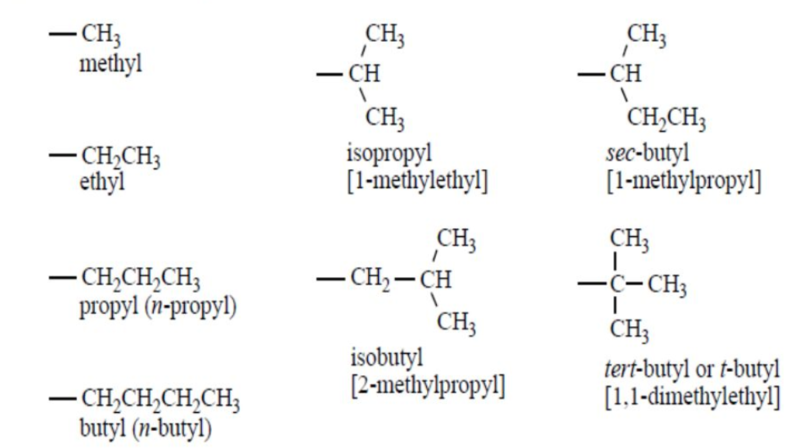 The prefix iso is used when the second carbon of the branched chain alkanes carries 1 methyl group while the prefix neo is used when second carbon of the branched chain alkanes carries 2 methyl group. The carbon atom in an alkane molecules may be classified into four types as primary(1°) ,secondary (2°) , tertiary (3°) and quaternary (4°). A carbon atom attached to one other carbon atom is called a primary carbon atom and is designated as 1°. A carbon atom attached to three other carbon atoms is called a tertiary carbon atom and is designated as 3°. A carbon atom attached to 4 other carbon atoms is called a quarternary carbon atom and is designated as 4°. The hydrogen atoms attached to 1° ,2° ,3° carbon atoms are called Primary ,secondary and tertiary hydrogen atoms. The removal of one hydrogen atom from the molecule of an alkane gives an alkyl group. Their names are derived by replacing the terminal ane of corresponding alkane by the suffix yl. Open chain hydrocarbons which contain carbon-carbon double or triple bonds in their molecules are called unsaturated hydrocarbons. These are of two types :alkenes and alkynes. Alkenes : Unsaturated aliphatic hydrocarbons containing a carbon carbon double bond are called alkene. They are also called all olefins since the lower members of this class react with chlorine to form oily products. Unsaturated aliphatic hydrocarbons containing a carbon carbon triple bonds are called alkynes. They are called acetylenes after the name of the first member of this family. Halogen derivatives of alkanes are called haloalkanes. They are further classified as mono, di, tri and tetra haloalkanes accordingly as they contain 1, 2, 3,4 halogen atoms respectively in their molecules. 1) Monohaloalkanes : The monohalogen derivatives of alkanes are called alkyl halides. The position of both the halogen atoms are indicated. Alkanes containing 2 halogen atoms per molecule are called dihaloalkanes. 1) Alkylidene dihalogen : Dihalogen derivatives of alkanes in which the two halogen atoms are attached to same carbon atom are called alkylidene dihalides or alkylidene halides. Since the position on the same carbon atom are called geminal position, therefore, alkylidene dihalides are also called geminal dihalides or simply gem-dihalides. 2) Alkylene dihalides : Dihalogen derivatives of alkanes in which the 2 halogen atoms are attached to adjacent carbon atoms of the chain are called alkylene dihalides or alkylene halides. Since position on the adjacent carbon atom are called vicinal position, therefore, alkylene dihalides are also called vicinal dihalides or simply vi-dihalides. 3) Polymethylene dihalides : Dihalogen derivatives of alkanes in which the 2 halogen derivatives are present on the terminal carbon atoms i.e. α , ω-position of the carbon chain are called polymethylene dihalides. All types of dihalides are called dihaloalkanes, the position of the halogen atoms being indicated by lowest possible arabic numerals. The general formula of trihaloalkanes is CnH2n-1X3 while that of tetrahaloalkanes is CnH2n-2X4 where n=1,2,3,4…. The position of the halogen atoms on the carbon chain be indicated by Arabic numerals. Alcohols are classified as monohydric ,dihydric, trihydric and polyhydric according as their molecule contains 1,2,3 and many hydroxyl groups. Presence of two or more hydroxyl groups on the same carbon atom makes the molecule unstable, therefore, in di, tri and polyhydric alcohol , each hydroxyl group is present on a different carbon atom. Common names: Add the word alcohol to the name of alkyl group i.e. IUPAC names: Replace the terminal e from the name of corresponding alkane by the suffix ol. Because of their sweet taste ,dihydric alcohols are called glycols. Depending upon the relative position of the two hydroxyl groups, they are further classified as α, β, γ …ω glycols. α-glycols are named by adding the word glycol to the common name of the alkene from which they have been prepared by direct hydroxylation. β, γ ,ω glycols are named as the corresponding polymethylene glycols. IUPAC name: Add the suffix diol to the name of the alkane containing the same number of carbon atoms as the diol. IUPAC name: Add the suffix triol to the name of the alkane containing the same number of carbon atoms as the triol. The position of the hydroxyl group is indicated by arabic numerals. General Formula: R-O-R’ where R and R’ are same or different alkyl group. If R=R’ ,ethers are called simple ethers and if R≠R’ then ethers are called mixed ethers. Common names: In mixed ethers, add the word ether to the name of the alkyl groups arranged in alphabetical order. In simple ethers , the numerical prefix di is added to the name of the alkyl group followed by the word ether. IUPAC name: In the IUPAC system, ethers are called alkoxyalkanes. The smaller alkyl group forms a part of the alkoxy group while the bigger alkyl group forms a part of the alkane. Common name: Replace ic acid from the common name of the corresponding acid which they give upon oxidation by the word aldehyde. IUPAC : Replace the terminal e from the name of the corresponding alkane by the suffix ,al. General Formula: CnH2n+1 CO CnH2n+1 where n=1,2,3…. or R-CO-R’ where R and R’ may be same or different alkyl group. If R = R’ , ketones are called simple ketones. If R≠ R’ , ketones are called mixed ketones. Common name: In case of mixed ketones , name the alkyl group in alphabetical order and then add the word ketone. In simple ketones, the numerical prefix di is used before the name of the alkyl group. IUPAC : Replace the terminal e from the name of the corresponding alkane by the suffix , one. General formula: R-CO-O-CO-R’ or (RCO)2O where R and R’ may be same or different alkyl group. Common name: Replace the word acid from the common or IUPAC name of the corresponding acid by word anhydride. Symmetrical anhydride of substituted carboxylic acids are named by adding the prefix bis to the name to indicate that two identical acyl group are present. Unsymmetrical anhydride are named by writing the names of the two acids alphabetically before the word anhydride. Common name or IUPAC name: Write the name of the alkyl group before the common or IUPAC name of the parent acid with its terminal ic acid replaced by oate. Common name : Replace ic acid from the common name of the corresponding acid by the secondary suffix amide. Common name : 1) Add the word amine to the name of the alkyl group , i.e. 2) Attach the prefix amino to the name of the corresponding alkane , i.e. General formula: R-NH-R’ where R and R’ may be same or different alkyl group. Common name : 1) Name the alkyl group in alphabetical order and then add the word amine.In case the two alkyl groups are same, the numerical prefix di is used before the name of the alkyl group. 2) Add the prefix N-alkyl before the name of the aminoalkane ; the smaller alkyl group forma a part of the N-alkyl group while the larger alkyl group forms a part of the alkane. General formula: R-N(R’R“) where R , R’ , R“ may be same or different alkyl group or two of them may be same while the third may be different. Common name : 1) Name the alkyl group in alphabetical order and then add the suffix amine.In case the two or all the three alkyl groups are same, the numerical prefix di and tri are used before the name of the alkyl group. 2) Add the prefix N-alkyl and N-alkyl to the name of the aminoalkane corresponding to the largest alkyl group. Common names: Add the secondary suffix nitrite to the name of the alkyl group i.e. IUPAC name: There are no IUPAC names for alkyl nitrites. Common name: 1) Add the suffix cyanide to the name of the alkyl group ,i.e. 2) Replace ic acid from the common name of the corresponding acid by the suffix onitrile. Common name: Add the suffix isocynanide or carbylamine to the name of the alkyl group. IUPAC name: There are no IUPAC for isocynaide or isonitrile.